Project Manager Salary $100,000 Per Year. That has a nice ring to it, doesn`t it? It’s an impressive career accomplishment even in the 21st century. What if you haven’t reached that career milestone yet? You’re in the right place to find a path to that goal. In this article, you will discover the insights – based on the best research – to help you reach that $100,000 salary. I’m going to focus on how you can achieve that level in a full time role as an employee ( consulting and entrepreneurship are other worthwhile pathways to that goal: those options are outside the scope of today’s article). There’s something special about earning $100,000 per year. For years, it has been a signal of success and a sign that “you’ve arrived.” That’s true even today, despite inflation. 1) Rites of Passage at $100,000 to $1 Million+: Your Insider’s Lifetime Guide to Executive Job-changing and Faster Career Progress in the 21st Century by John Lucht. This classic career book, recommended by Manager Tools, is focused at senior managers and executives. In the minds of many readers, a six figures income brings all the status of joining the executive suite. 2) The price of paying for “the American Dream” is $130,000 per year for a family of four in the United States according to USA Today. 3) An annual household income of $111,000 puts you in the top 20% (the top 1% starts at $360,000) of income earners in the United States in 2011 according to NPR. 4) If you saved $10,000 (10% of $100,000 income) for 25 years and earned a 7% return, your investments would reach $632,000 dollars (If you make invest and save for another 6 years, you would reach $1 million). Note: this calculation assumes you are starting from zero. If you have other investments, you can achieve much higher wealth. Clearly, there’s a lot to be gained from reaching the $100,000 project manager salary level. There are also career benefits to earning six figures that could beyond the personal benefits outlined above. We’re not just talking about bragging rights. Once you reach the six figure income level, you are likely to have staff to manage. That means you have the challenge (and rewards) of developing people. Further, a six figure income means you have developed significant career capital. You will have more and more options to choose your projects and increase your satisfaction. Now we understand the importance and value of obtaining a six figure income, how do we get there? 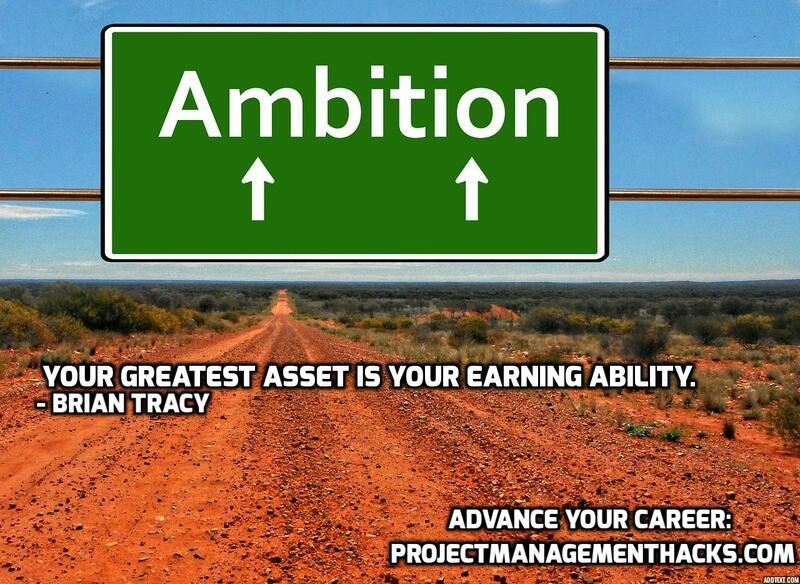 Once you decide on obtaining a six figure project manager salary, what’s your next step? You could start by applying for new jobs that appear to be high paying. Or you could start by asking friends in your network if they know anybody who knows of six figure opportunities. These approaches miss the mark. You need to start by discovering the best opportunities and capabilities of six figure project managers. Fortunately, the Project Management Institute (PMI) has taken the guess work out of earning a high income. In the Project Management Salary Survey (8th Edition), PMI collected data from over 13,000 project managers in the United States. Out of those surveyed, the median salary reported was $108,000 per year. That’s encouraging! Yet, it doesn’t tell us very much on how to reach that level. You need more details. I understand completely. Let’s look at the top four factors that shape a high project manager salary. Click “Read More” for all the data and detailed analysis! It’s no secret that work experience matters in project management. That’s why PMI asks for a detailed description for applicants who apply for the Project Management Professional (PMP) certification. Under the current requirements, PMP candidates must have a minimum of 4500 hours of project management experience (7500 hours are required if you do not have a four year bachelor’s degree). Tailor: The act of carefully selecting process and related inputs and outputs contained within the PMBOK Guide to determine a subset of specific processes that will be included within a project’s overall management approach. Knowing when and how to use all the tools and techniques of project management takes time to learn. For Early Career Project Managers: If you have less than 10 years of experience, reaching the $100,000 salary will be challenging. 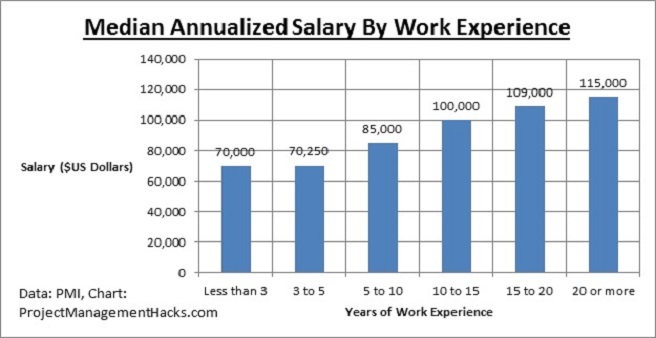 If you’re already earning that salary with less than ten years of experience, congratulations! If not, keep building on your experience, knowledge and check that you are in a high earning industry (to be covered later in this article). For Mid To Late Career Project Managers: In many industries, ten years of experience starts to open new experiences. In law and accounting, professionals often become partners (or they are very close to achieving the partnership). If you have delivered significant success on your projects and still have not reached the $100,000 salary level, then you need to give some thought to your compensation. Before we move on, I’d like to add a general observation regarding work experience. Have you ever noticed that some job postings will include phrases such as “progressive experience”? That means organizations are looking for professionals who are constantly growing their skills and experience. Early in your career, you might be managing a very small team. What about five years later? If you are not managing larger and more complex projects, it may appear that your skills have plateaued. Evaluate Your Experience Against The PMBOK’s Knowledge Domains (e.g. integration management, time management, risk management, quality management). It’s natural to focus on our areas of strength. For example, your engineering education may equip you with outstanding quality skills. In contrast, you may have little experience managing stakeholders and project finances. Your limited experience in those areas may be holding you back from taking on more ambitious projects. When you’re deep in the details on a project, it is easy to lose track of the benefits. Numerous change requests also complicate the situation. If you lose track of your project’s benefits (especially increased revenue or efficiency benefits), your executive and project sponsor may forget the value of your projects. As an exercise, look back over the last twelve months and write down three benefits your organization received from your projects (e.g. attracted 1,000 new customers, reduced manufacturing time by 5 days or reduced defects by 50%). Meet With Your Executives (or PMO) To Learn About New Projects Under Development. From time to time, you may find yourself working on an unglamorous project. In that case, your short term responsibility is to deliver that project to best of your ability. At the same time, take action to get a better project next time. Ask for a short meeting with the person in your organization who makes project decisions (e.g. CEO, CIO or leader of the Project Management Office). Ask about upcoming projects and which will make the greatest impact. By taking the time to express your interest and build the relationship, you are much more likely to land better projects in the future. Enthusiastic Achievers: This elite group regularly looks for educational experiences to develop their skills and knowledge. They regard their PDU requirements to maintain the PMP certification as a minimum, rather than a maximum. They take a broad view of education: self study through books and courses, attending events and learning from others in their network. The Discouraged Masses. This group assumes that education ends on graduation day. Whenever they think of education, they think of sitting bored in a classroom. They sometimes pursue training and development but only when strongly incentivized (i.e. fulfilling the minimum PDU requirements or completing training as suggested by their manager). I strongly hope that you are in the achievers group! If you’re discouraged, then this section will help you to realize the importance of education in your career. There are two ways to see the impact of education and training on income. The first measure looks at the impact of formal education such as university degrees. The second approach looks at the benefit of learning and applying specific project management techniques such as critical chain. Let’s look at both. Note: High School (median: $101,500) and Doctoral Degree (median: $101,500) are excluded from the chart since both of those categories less than 400 respondents in PMI’s survey. In addition, the educational categories from the US Census and PMI’s survey are identical; however, they are close enough to facilitate a comparison. Successfully completing an undergraduate or graduate degree is associated with an income over $100,000. If you’re considering going back to school to finish your first degree, Figure 2 may give you some encouragement. If your organization provides funding or other support to earn a degree, then the return on effort is absolutely worth the effort. Quite beyond financial benefits, I’m an advocate of higher education. That’s one of the reasons why I’m a volunteer at my alma mater, the University of Toronto. But I digress. 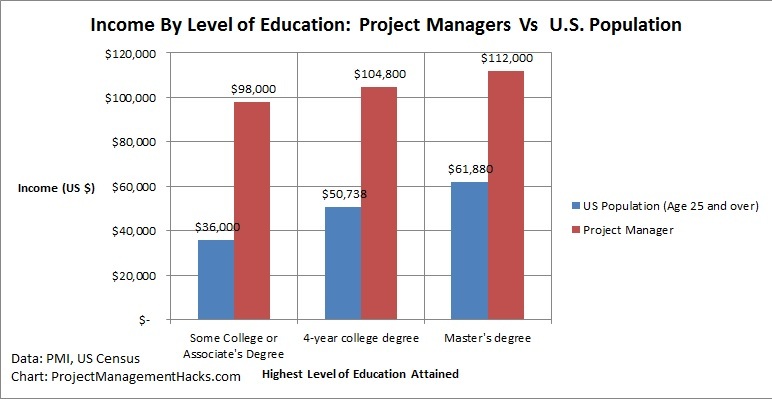 How do well educated project managers compares with the broader American population? That’s a great question! Let’s consider the following data from the 2013 U.S. Census presented in figure 2 above. In each of the three education categories, project managers earn more than the U.S. population with an equivalent educational attainment. I realize this comparison has its limitations. However, I believe that the following observation is true. Even when you control for formal education as a variable, project managers earn more than the general population. The high project manager salary data reported in this survey suggests interesting possibilities. If you already possess a degree, then you may be able to significantly increase your income by transitioning into project management. Of course, making such a transition does take significant effort and study. Fortunately, the Project Management Institute predicts that demand for project managers will continue to grow in the coming years. In many areas of the economy, you can earn rewards from specialization. For example, medical doctors who specialize in a field such as radiology and orthopedics report compensation over $300,000, roughly double the income of family medicine professionals (source: Medscape Physician Compensation Report: 2012 Results). Many of us have observed that general principle in numerous occupations. The question remains – can you earn a higher project manager salary by specializing? Certain project management specializations do tend to be report very high incomes. The salary survey collected data on thirteen types of specialization including change management, critical chain project management, resource management and program management. One note of caution before I reveal the data – the samples for these groups are relatively small and likely less accurate and definitive than the larger groups previously discussed. Note: The data above is drawn from the PMI Survey: Respondents with 1-5 Years of experience in the named technique, median salary only. Of the thirteen specialized techniques covered, the median ranged from $98,000 to $108,000. It appears that technique specialization has an impact (though not as drastic as the differences among physicians). Clearly, specialization can give you an edge and it does put you in the $100,000 project manager salary area. Did you know that a very large percentage of MBA graduates go into just two industries? According to CNBC, approximately one third of Harvard MBA graduates go into financial services (with many focused on investment banking and hedge funds). Why? It is no secret that the industry offers high compensation and a degree of prestige (though both can involve many hours of grinding through data in Microsoft Excel). We can learn two important lessons from the stampede into the financial industry by freshly minted MBAs. Lesson One: Very long work hours are positively correlated with high income (i.e. your hourly rate may not be very impressive). In a sense, people in these highly demanding industries are being paid as a reward for dedicating a great deal – more than the average in our economy – to their employers. Lesson Two: If your work has an impact on high value activities – such as taking a company public – you have an incredible impact. Think of it this way: if you make an investment bank an additional $2 million in profit, then a $100,000 bonus almost looks small. Tip: In some cases, you can achieve high leverage with limited hours – that’s the premise of Tim Ferriss’s outstanding blog and best-selling book “The 4-Hour Work Week.” As powerful as the Pareto Principle (i.e. the 80/20 principle) is, it is easier to earn six figures if you start out in the right industry. Keep these concepts in mind as we discover the industries that pay the highest project manager salaries. Highly specialized knowledge and technical expertise are hallmarks of these industries. For example, two of the industries (resources and engineering) are dominated by engineers, a very highly paid profession that requires years of advanced study. There’s also something counter-intuitive about the above list. Financial services did not make it into the top five when it comes to project manager pay. That just goes to show that you can’t always rely on broader economic trends to select your industry. To be fair, the median salary in financial services is nothing to sneeze at either ($106,000). Switch industries to grow your income. You might be in a declining industry. Or your industry may simply not place a high value on project management. In either case, advancement to a higher project manager salary will be easier if you switch to an industry where your contribution is likely to be valued. Project Management and Technical Professions. Many project managers begin their careers in technology and engineering. If you are currently in engineering and desire fresh challenges where you can make a greater impact, project management may be a great choice. Commit to finding opportunities in a growing industry. You may have read the statistics earlier in this section and said to yourself, “Hey, I’m in the resources industry and I earn far less than $100,000? What’s going on?” Don’t worry – we’re going to address that point next. If you are already in an industry that tends to reward project managers handsomely , congratulations! You have an excellent foundation in place to grow your income. From that starting point, you may have to grow your capabilities in other ways – such as earning the PMP certification or taking on more complex projects. Career advancement can be accelerated with the right ideas but we can’t achieve miracles just yet! If you started your career as a project manager two years ago, a six figure compensation package is likely some years away. In The Middle Ages, books were very expensive. The library of the Université de Paris has 1017 books in 1289. The largest collections in Europe totalled a few hundred manuscript books – texts that were copied by hand. The sheer expense of producing books meant less knowledge could be circulated. In 2013, there were 200,000 international patent applications filed – 57,000 from the United States. Source: World Intellectual Property Organization. In 2014, the Santa Fe Institute celebrated thirty years of complexity studies. Source: Santa Fe Institute. By any measure, our world is becoming more complex. Despite these challenges, organizations and companies are determined to improve and make changes. That’s why your ability to manage complex projects impacts your potential earnings. In this study, I am going to use project budget as a proxy for complexity. As a general observation, projects with larger budgets have more moving parts, more risk and greater scrutiny from management. Let’s discover the relationship between project manager income and project budgets next. In reviewing this chart, we can make one key observation. To reach a $100,000 income, you need to take on projects with large budgets. As a rule of thumb, I would suggest focusing on projects with budgets over $1 million. Of course, you will need to tailor this concept to meet the parameters of your organization. There you have it! The four factors that influence your ability to earn over $100,000. How have you increased your value and income in the past year? Pingback: Can Money Really Reflect The Value Of College Majors? Pingback: 10 Money Mistakes Successful People Don’t Make | Solve Fast! Great article BUT one major formatting issue! Remove the motionless “Share” box located on the left of a mobile screen. Having this box here makes it really difficult to read your article and even read my own typing feedback. I highly suggest to move this “Share” box to the bottom or top of the screen, NOT the left or right as it blocks a viewers area to read. Thank you. You know what, I opened the page on my computer’s browser and left it open for more than a week despite the temptation of closing it, hopping I would read it when I got the time. Now, I read it and worth to resist the temptation. Much of the data or figures do not directly reflect my context, as it is mainly based on the North America, but I, generally, find it as an invaluable input to somebody like me who wants to challenge himself in project management. I appreciate the experience and the desire to share it. Great article…extremely insightful. Thanks so much for sharing this data.